So says Michael Johnston (www.commodityhq.com) in edited excerpts from his original article*. Investor interest in commodities has surged in recent years, the result of both a prolonged rally in natural resource prices and the development of new vehicles that facilitate access to this asset class. Specifically, the launch of a robust lineup of exchange-traded products (ETPs) that utilize both physical commodities and commodity futures contracts has brought commodities to the masses; they’re no longer reserved for the largest and most sophisticated investors. Perhaps the most common–and most dangerous–misconception about commodity ETFs and ETNs is that these products offer investors exposure to the spot prices of the underlying commodities. It’s not uncommon for the second point on the list [above] to be the driving force, and the reason why returns on commodity ETPs can deviate significantly from a hypothetical investment in the spot commodity. For an investor who solely invests in futures contracts, contango [that is, when the futures price is above the expected future spot price the price will decline to the spot price before the delivery date] may not be as big of an issue but given the fact that commodity ETPs have soared in assets in recent years, there are a large…[number] of people who rely on these products for their commodity exposure, and it is highly likely that a number of them have been burned by contango. A futures-based ETP follows a strict process which, when combined with contango, slowly but surely destroys a position. When futures are contangoed, this forces the particular fund to sell the contract low, and buy the next contract for a higher price, erasing value with the blink of an eye. When this process is dragged out over several months, these funds have a nasty habit of producing some rough returns. To keep away from such a common anomaly use first-generation futures funds, like UNG and USO, as trading instruments. Their automated roll process will always fall prey to a contangoed environment, and therefore it is not often wise to establish a long term position in such a fund. Instead investors should measure their holding periods of these products in days and hours, rather than weeks and months, to help avoid the pitfalls of the auto-roll. For those who are uncomfortable with actively trading a fund, there are now a wide variety of ETPs that are focused on eliminating contango. These next-generation products will often hold several futures contracts at once and their roll process does not always involve buying the next month’s contract, but rather one that matures further into the future. The most popular kind of commodity ETP is a first generation futures fund; one that simply invests in front-month futures and features an automated roll process…When an ETP’s contract is about to reach maturity, the fund executes an automated roll process so as to avoid delivery. Most investors tend to gloss over the differences between these two product types, since they generally function in almost identical fashion. When it comes to accessing commodities, however, the differences between these two product structures can be significant. For starters, tracking error can become a big issue with products that regularly “roll” futures contracts to avoid taking physical possession; ETFs that are continuously buying and selling futures contracts are likely to deviate slightly from their target index. ETNs don’t have that concern, since there are no underlying holdings; the value of these securities simply moves along with the index. Basically, it is worth doing your homework into the various structures at your disposal for accessing commodities; the choice you make can have a potentially significant impact on your credit risk, tax liabilities, and tracking error. Most investors look at ETNs with skepticism, wary of the credit risk contained. That risk component certainly shouldn’t be ignored completely, but it is worth noting that there are some appealing attributes of the ETN structure as well. The difference between a commodity ETF and a commodity ETN can translate into sizable discrepancies in tax obligations. Most commodity ETPs that actually hold futures contracts–meaning the non-ETN segment of the universe–are structured as partnerships for tax purposes. That means that these securities are taxed at a blended rate between short-term and long-term capital gains (the 60/40 split results in an effective rate of about 23%). Moreover, these securities incur a tax liability annually regardless of whether shares were sold…[and] require [financial] advisors to fill out a K-1, which can be an administrative headache to some. Compare all of [the above] to the simplicity of commodity ETNs, which are generally only taxed upon sale at the applicable short-term or long-term rates. Moreover, commodity ETNs are reported of a form 1099; there’s no K-1 to deal with on these products. [Also]…keep in mind that physically-backed precious metals ETFs, such as the ultra-popular GLD and IAU, are subject to being taxes as collectibles. When it comes to commodity investing, many investors commit the sin of energy bias, whereby the majority of their commodity holdings fall under the umbrella of an asset like crude oil or natural gas. To be fair, energy products are among the most popular in the commodity world, but exhibiting a bias towards these investments can have some adverse effects on your portfolio. Energy products are quite often highly correlated to the movement of general markets, meaning that they will move closely in line with something like the S&P 500. One of the main reasons that commodity exposure is essential to a portfolio is the low correlation and diversification benefits that these investments offer. An energy-heavy portfolio will likely only steepen your losses on bad days which may not be enough to be erased by days in the black. Energy investments are obviously very important, as the majority of these commodities offer relatively inelastic demand because we cannot survive without them in our daily lives, but with these futures and products being particularly volatile, committing a bias may only hurt you in the long run. Instead, it is important to remember to keep vital energy holdings in check with other commodities like precious metals or softs. This way, a portfolio will still reap all of the benefits offered from energy, but will also gain the diversity of commodities tied to vastly different price drivers that offer sometimes zero correlation to major benchmarks. Commodity investing can be an expensive venture, and if one is not careful, it can be easy to erase value through expenses like commissions and other fees associated with trading. One of the first things every investor should do is take a look at their strategy and then research if there is a cheaper way to gain the exposure. Often times, there is a corresponding ETP to a futures-based strategy that can offer a much more enticing expense structure. The constant shifting of positions required by commodity investing can quickly eat away bottom-line returns, as commission fees rack up quickly, not to mention the capital gains on a short term trade. Failing to consider one’s expenses is essentially allowing the markets to steal from you. When considering your commodity trading strategy it is important to see the bigger picture. Is there a fund that trades the same contracts for a lower price? Is there a company that offers good exposure to a commodity that doesn’t require the constant movements that are needed for futures investing? Most important of all, is there a cheaper way to employ the same strategy? While a few measly basis points may not seem like a lot, consider a portfolio of $1,000,000. Let’s say that each year that portfolio is subject to fees of 1% of total assets (not an uncommon expense for active traders). If one were to eliminate 0.25% from that figure, you could save $2,500 every year. Drag that out over ten years of trading and you have an extra $25,000 sitting in your pocket. Commodity investing can be expensive, but there are plenty of ways to beat the fees, it simply takes diligent and careful research. holding stocks of companies whose operations revolve around the exploration, extraction, and sale of commodities. [Regarding #3 above,] stocks of gold mining companies can be seen as an indirect investment in gold [as they] tend to exhibit relatively strong correlations to the underlying resources… because the profitability of these companies generally depends on the market price for the goods they sell. In the case of a gold miner, higher gold prices will generally translate into higher earnings since they will receive more money for each ounce of the metal they uncover and sell. Similarly, oil stocks tend to perform well when crude prices climb and timber stocks do well when lumber prices are elevated. The benefit of this approach is that stocks don’t exhibit contango that is common in commodity futures contracts–often to the detriment of positions in these securities. It should be noted, however, that stocks of commodity-intensive companies will not always exhibit perfect correlation with the underlying natural resource. These stocks are, after all, stocks – meaning that they will be impacted by movements in broad global equity markets. That may diminish one of the appealing attributes of commodities; the potential for diversification benefits and a low correlation with stocks and bonds. The old saying is that there is more than one way to skin a cat. That’s certainly applicable when it comes to investing in commodities; there are a number of different ways to tap into this asset class. Even in a futures-based approach to investing in natural resources, there are multiple options for crafting a commodity position. The details of an investment in commodities may seem insignificant, but they can actually end up having a meaningful impact on bottom line returns and volatility. For any given commodity, there are generally multiple futures contracts that are distinguished by the maturity date. For example, there are crude oil contracts traded on the NYMEX expiring each month of the year. Other futures have four or five maturity points in each calendar year, and in many cases there are contracts listed for years in advance (it is possible to, for example, to invest in a crude oil futures contract that expires in 2015). Many of the commodity ETPs on the market focus on front month futures contracts, rolling exposure as the contracts approach expiration and using the proceeds to invest in the second month futures contracts. The benefit of this strategy is that front month futures tend to exhibit the strongest correlation to spot prices in the short term, meaning that products such as USO and UNG are optimal for those expecting to be in a position for a short period of time. The downside is the potential for the adverse effects of contango. Products that focus on front month futures must roll holdings on a monthly basis [and, as such,] they are vulnerable to more frequent return erosion resulting from an upward-sloping futures curve. ETPs that spread exposure across 12 months of futures contracts, on the other hand, may not experience the same degree of return erosion since only a fraction of the portfolio changes each month. In return for that benefit, these products might not exhibit quite the same correlation to spot prices. Finally, there are a growing number of ETPs that don’t stick to a predetermined roll strategy, instead examining observable market prices to determine which contracts are optimal for minimizing the adverse impact of contango or maximizing the benefit of backwardation. While these approaches and the products that employ them may seem similar, they can lead to very different results. Make sure you understand the nuances of each strategy before jumping in to a commodity ETP. 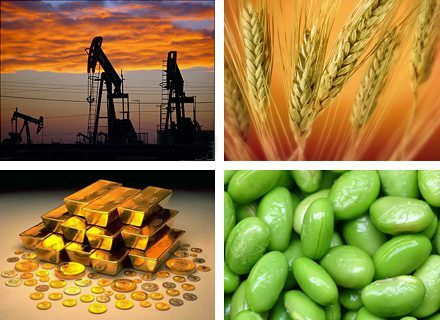 Investing in commodities…is generally assumed to be an effective way to protect investor portfolios from the adverse impact of inflation. Because inflation, by definition, means an increase in prices, this can obviously be a boost to natural resource prices and rising prices for energy, metals, and agriculture results in a higher consumer price index (CPI). While inflation is generally bad for fixed income and can have an adverse impact on stock prices as well, the conventional wisdom is that this phenomenon is a big positive for positions in commodities. It is important to understand, however, that not all individual commodities are equally effective as inflation hedges. Some exhibit a very strong correlation with indications of rising prices such as the CPI, while others are not nearly as effective. That means that for investors concerned primarily with protecting their portfolios from the ravages of inflation, picking the right commodity (or commodities) is a key consideration. Though estimates vary, as many as 90% to 95% of commodity investors report losses from their trading activities. Commodities are volatile, difficult to predict, and as such, can be extremely frustrating investments. One sure way to lose money is to simply neglect a position. While it seems fairly obvious that a lack of monitoring is a poor choice, the recent influx in commodity ETPs has made this asset class more readily accessible to those who may not be used to keeping a watchful eye on their positions. A commodity position will typically be measured in hours and days rather than months and years. Prices can be extremely volatile with seemingly insignificant events having a major trickle-down effect on the underlying investment, so the need for active monitoring is vital to the commodity space. Note that this piece of advice is most applicable to futures-based investments; there are a select few physically-backed commodity ETPs as well as equity investments that can be used for longer term strategies. If you do not have the time to watch your position through out the day, you probably have no business making the investment in the first place. Other than VIX contracts, commodities can be some of the most volatile investments available today and investors need to proceed with caution. On the flip side, actively monitoring will not only avoid losses, but it will typically lead to gains. Those who keep one ear to the ground so to speak, will have a much better chance of hopping in and out of trends intraday and turning a quick profit from the momentum of commodity markets. Commodity trading is meant to be volatile and for those who are unable to stomach the risk, it can be a brutal investing process. As a more general piece of advice, have a profit objective for each position and be willing to accept your losses when you were wrong. A sound and stable mind combined with good risk management will lead to smarter and more effective commodity trades. Previous What Does QE Really Do – and NOT Do? Next How Did This “Stealth” Rise In Gold Happen?